A white sofa is gorgeous and neutral foundation to a space, so how do you decorate with a white sofa and colorful throw pillows. To me, colorful throw pillows on a white sofa, are essentially like putting icing on a cake. Through selective use of throw pillows, one can add interesting patterns, texture and color AND change the entire look and feel of your sofa! Colorful throw pillows are not only an affordable way to decorate a white sofa, they also allow for a great deal of creativity and versatility. 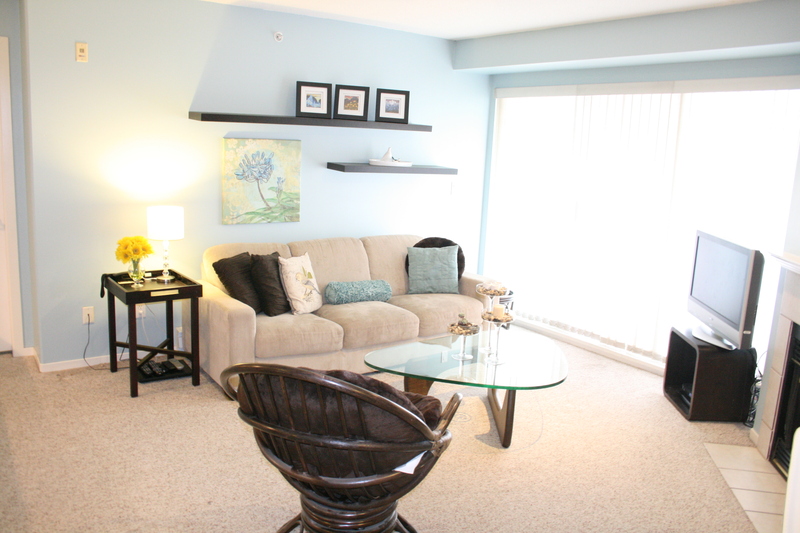 For example, you can merely change the toss pillows on sofa and change color palette of your entire space! 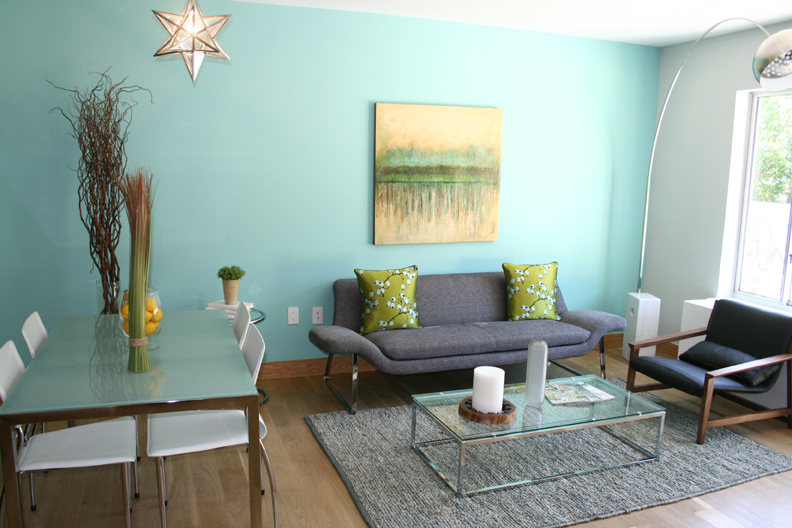 Home staging is about much more than cleaning, rearranging and organizing. Little details matter just as much, and have the potential to make a vast difference in the appearance of your home. These little (and inexpensive!) tricks just might be the finishing touch you need. 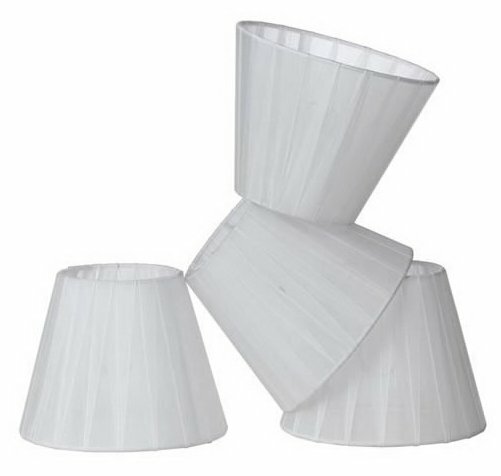 1.Replace lamp shades. Brighten up a room with a lighter shade, or go darker to cast a warm glow. Just be careful not to go too dark! 2. Bring in new hardware. Breathe a new life into your doors, cabinets and drawers by simply replacing the hardware. 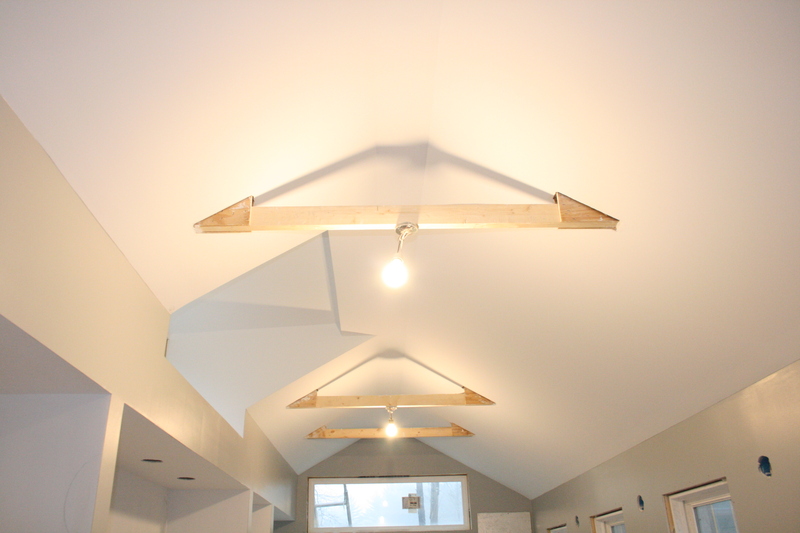 You’ll be surprised at how it can transform a room! 3. Buy new bath coordinates. 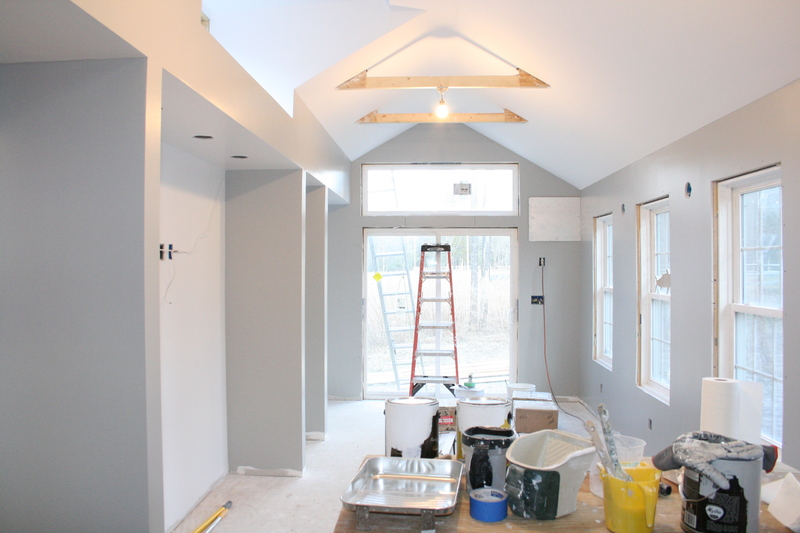 If what you currently have is mismatched, it can be off-putting to potential buyers. 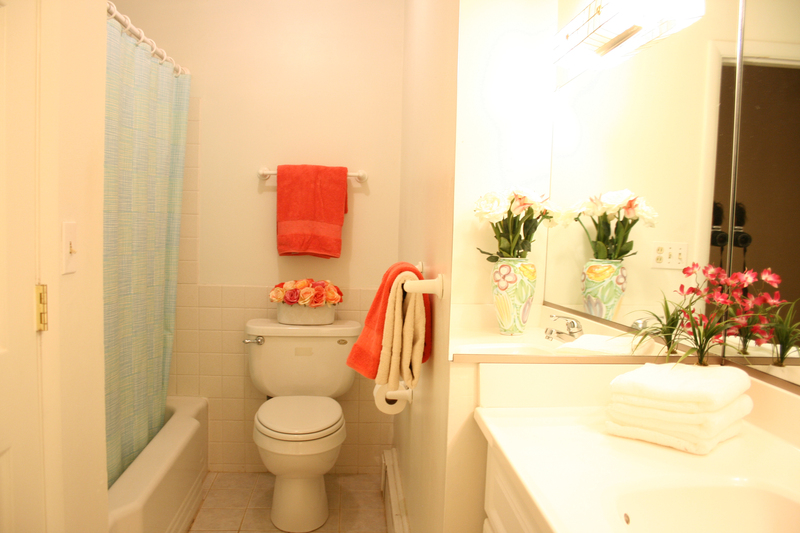 New rugs, towels and a shower curtain all in complimentary colors will do wonders for your bathroom. Photo Credit: Cathy Hobbs. 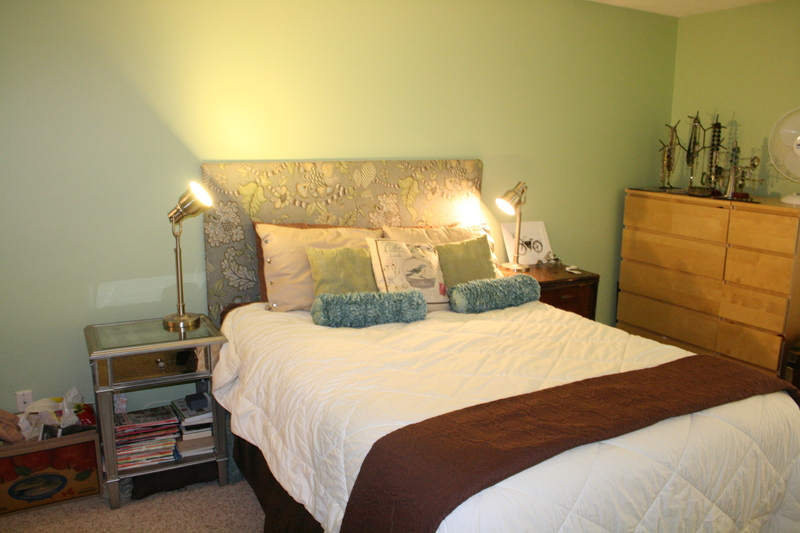 Staged by a Cathy Hobbs Home Staging Class. 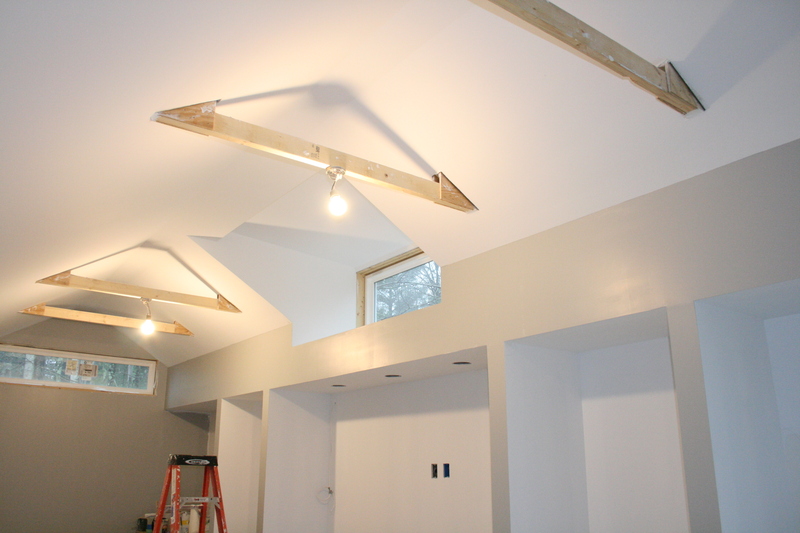 Project of the Week: Transforming an Amish Shed into a Modern Studio UPDATE: Painting is complete! 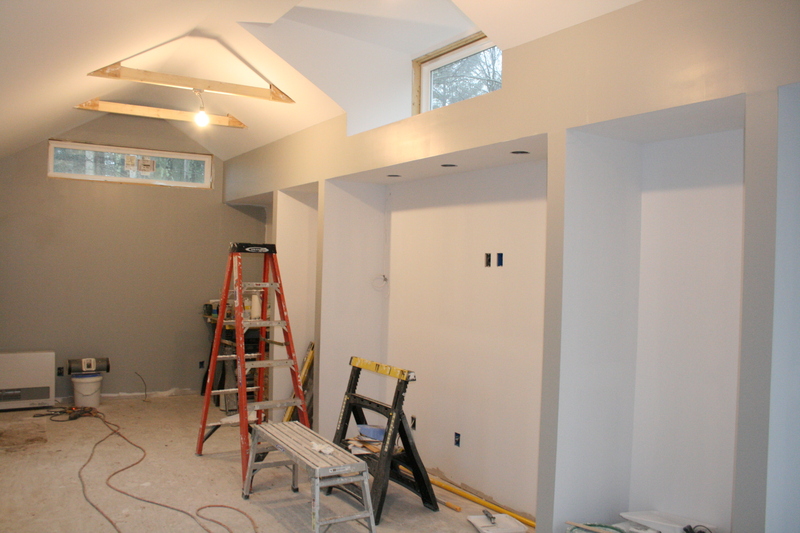 ≈ Comments Off on Project of the Week: Transforming an Amish Shed into a Modern Studio UPDATE: Painting is complete! Happy end of summer! We typically profile our Project of the week on Monday, but given yesterday was Labor Day, I decided to profile our on-going project today. 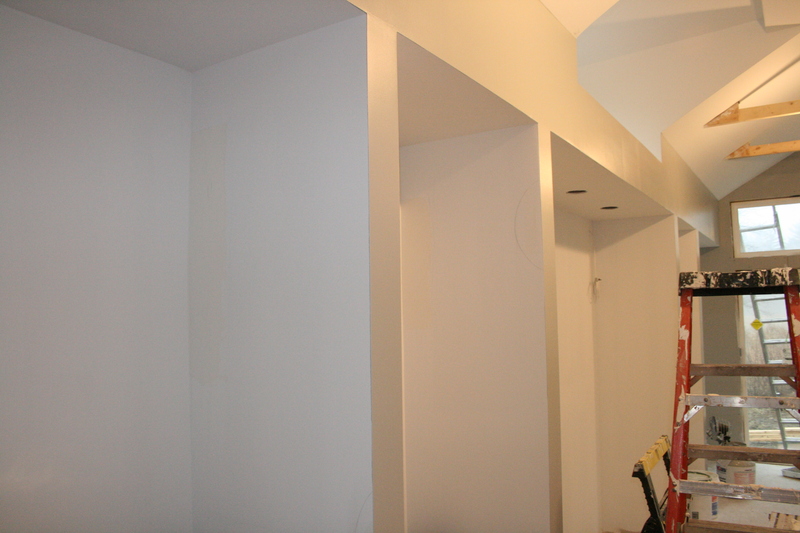 If you have been a loyal follower of this blog then you know that a couple of months ago, I set out to build an affordable free-standing studio/work space, in order words a “woman cave”. There were three main goals; one was affordability, durability and aesthetics. I wanted a space that was warm and inviting where I would enjoy working and a space that could also double as an extra living space. All of these steps actually took about two weeks, now that it is all complete we have completed another milestone, the painting! 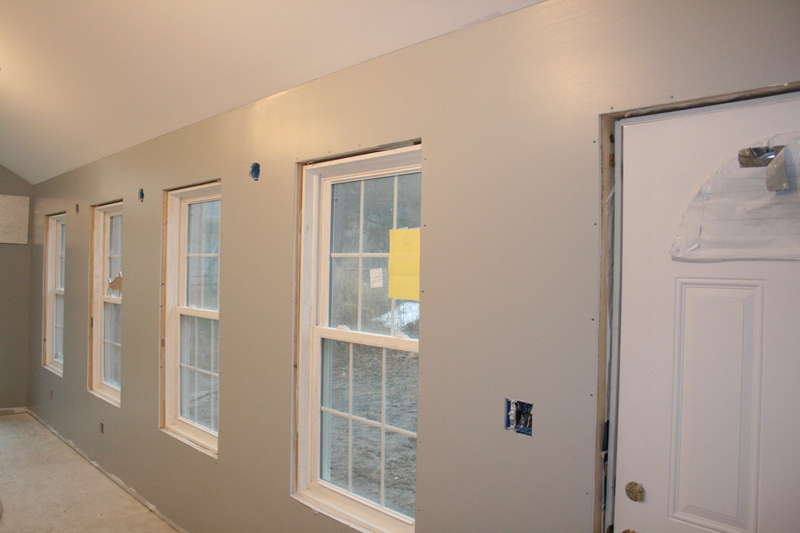 Because the drywall was brand new, the priming was critical. 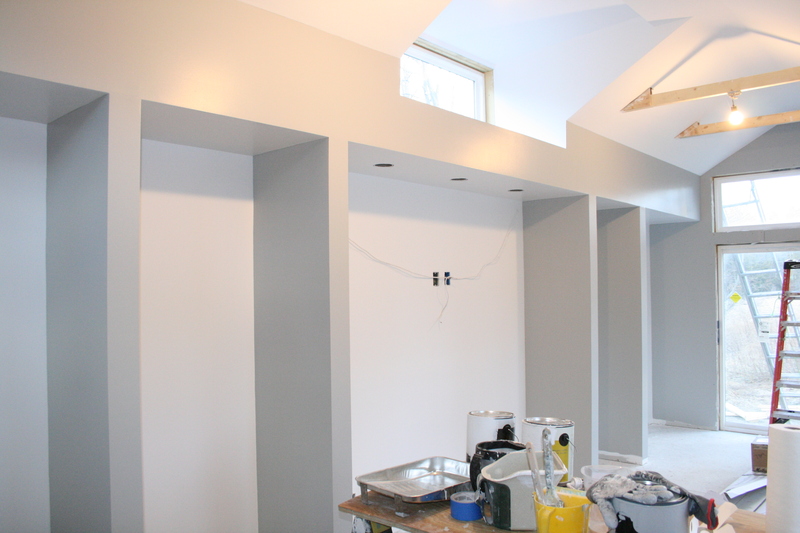 Three coats of primer were applied. 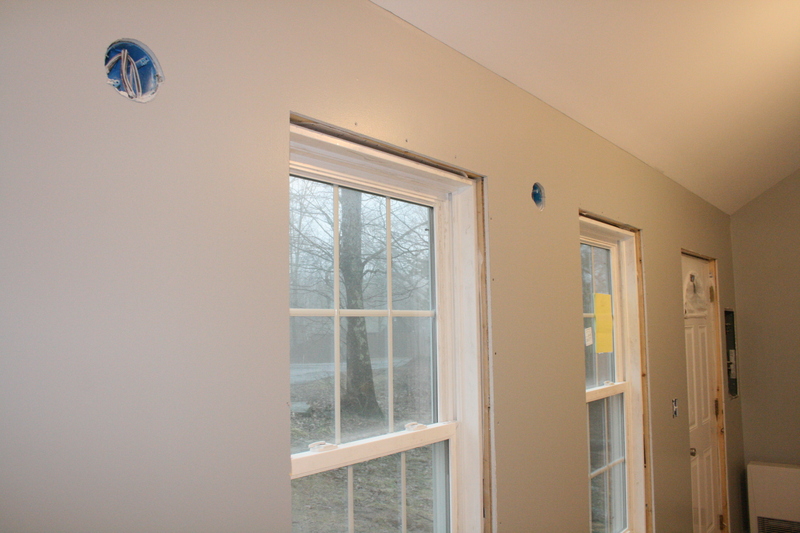 The primer, from Mythic Paint, the world leader in sustainable paints, specializing in paints that are zero toxins, zero odor and zero voc. As the exclusive brand ambassador for Mythic paint where I also have a signature paint line, I can tell you the richness and smoothness of the paint is superb, not to mention, the pleasantness of knowing you have selected a paint that won’t harm you or your family. As far as color, I wanted to select a color that was neutral and felt warm, but I did not want to select a taupe or beige. 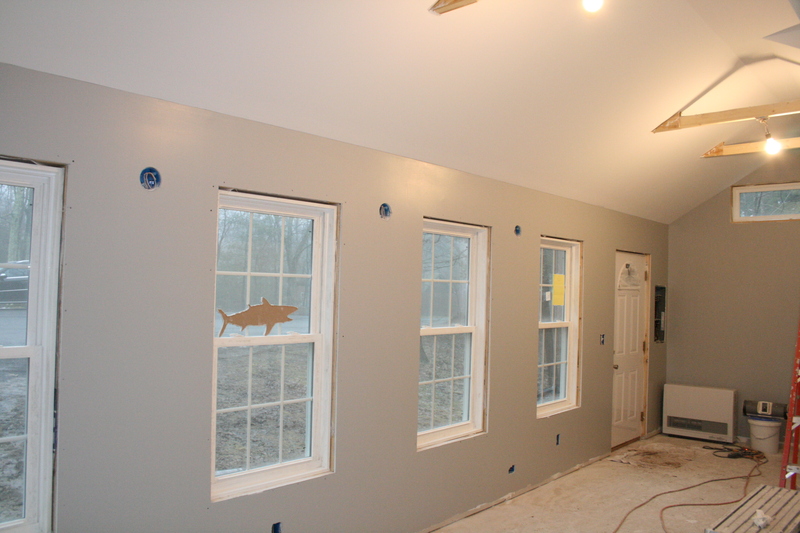 Instead, I opted for a gray/blue from my signature line with Mythic Paint. 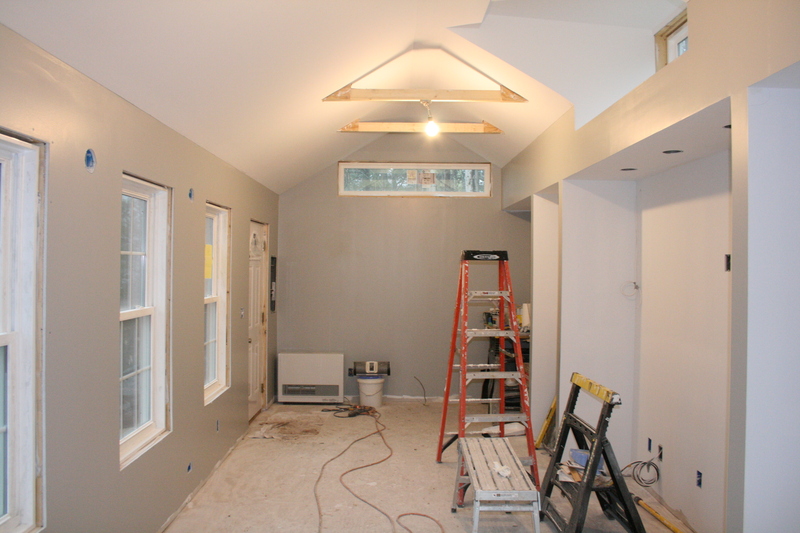 The color is called Cathy’s Bremen Gray (Color 141-3). I love the way it looks so far! 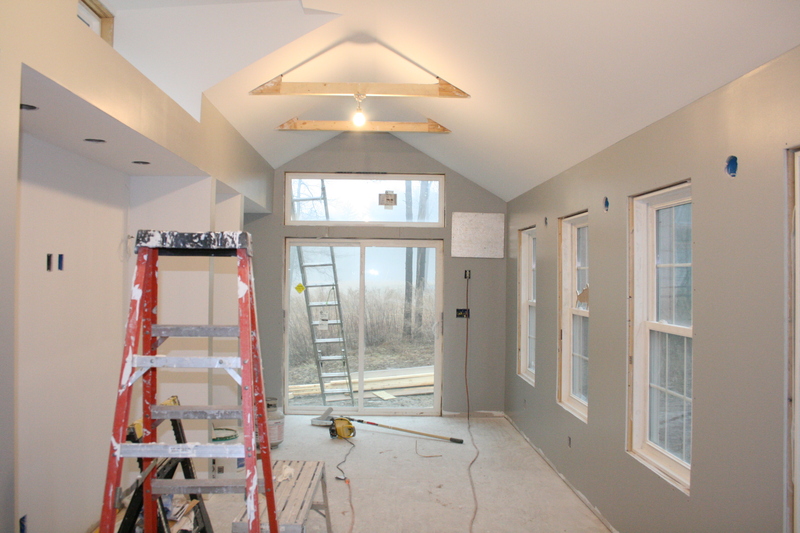 Looking for the perfect paint color for your space, why not try Mythic Paint. USE DISCOUNT CODE: CATHY – to enjoy 10-PERCENT OFF your purchase! When it comes to selling real estate, it is all about creating just the right marketing tool so the property sells for the most amount of money in the shortest amount of time. 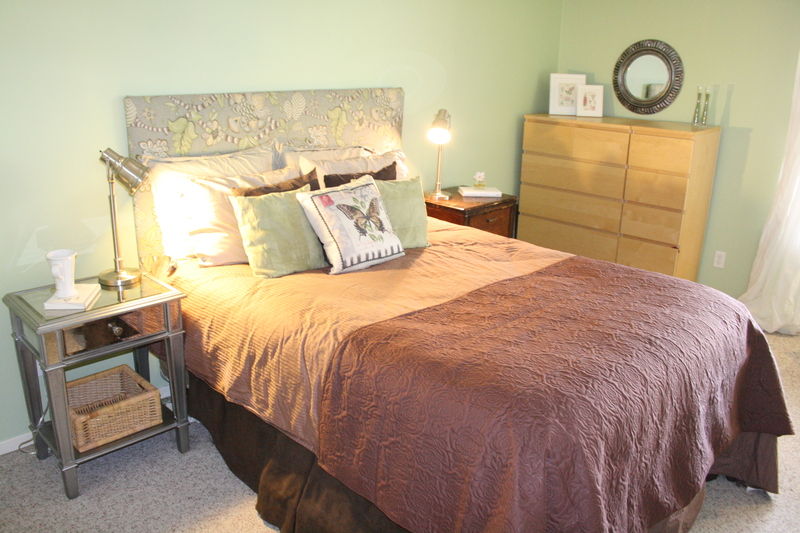 Home Staging can essentially involve spending a lot of money, but it doesn’t have to!! Today’s tip is all about using what you have! 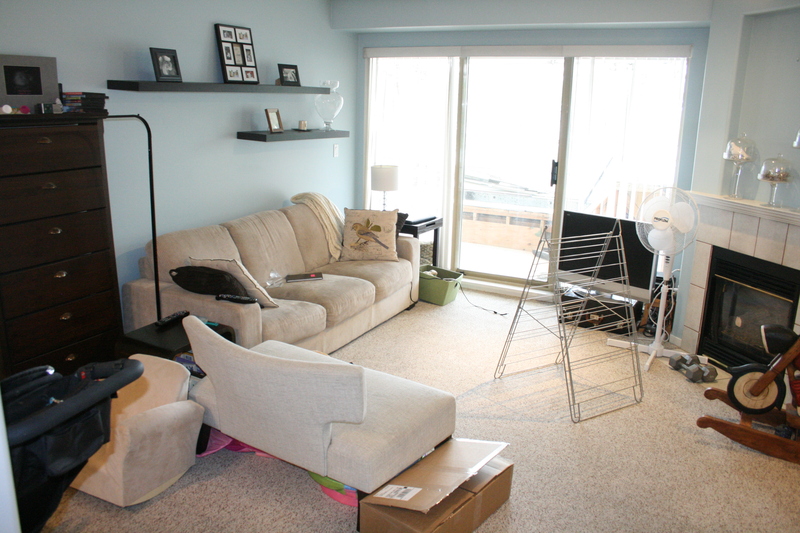 Recently I traveled to Vancouver, British Columbia where students in my home staging course transformed a two bedroom condominium. The project had zero budget, the only option was to use the furniture and accessories of the home owner. 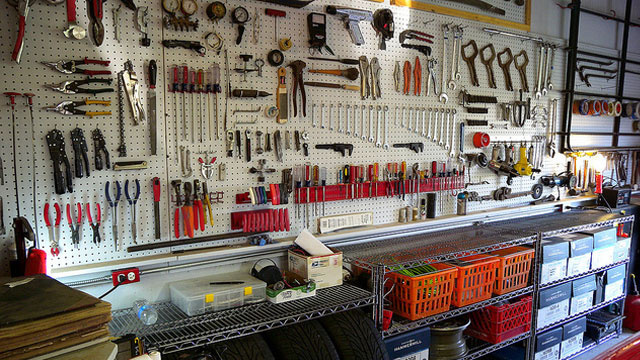 First and foremost, don’t be afraid to PURGE, getting rid of all of those unwanted items. I always tell clients, edit, then edit again. Next, find a useful and functional place for each furniture piece. 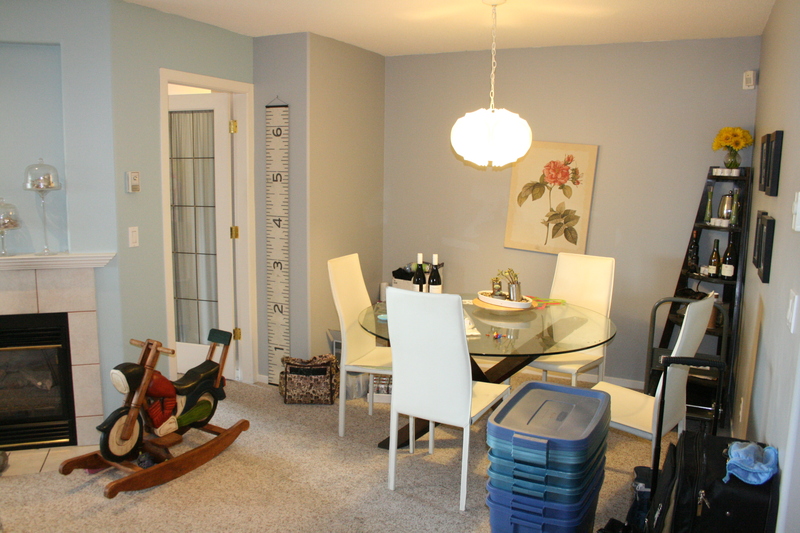 Often, there is excess furniture in a space, that could serve a better purpose elsewhere. Bedrooms should convey a feel of peace and tranquility, perhaps a spa like retreat, now this one does! Looking for more affordable design ideas? Be sure to check out my Design Recipes Collection which you can buy directly on my website! The recipes are only $3.00 and give you EVERYTHING you need to create the room! I give you step by step details of how the rooms were created and best of all, all of the resource information!! Decorating and designing has NEVER been so easy! Click here for this modern living room! Buy this recipe and more at http://www.design-recipes.com! I hope you’ve found these tips helpful and I can’t wait for you to check back next week for another Cathy’s Home Staging Secret! 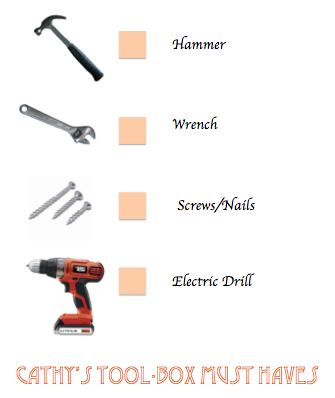 Whether you are doing a Project of the Week like I am or just needing to fix something around the house, having a reliable set of tools is crucial! Here are my top 4 must haves! I think it’s so important to have good tools so you can fix things without having to hire someone else to do it AND you can do fun projects, too! 1. Hang up artwork around the house with nails and a hammer. 2. Reupholster a chair with your electric drill and some fabulous fabric. 3. Use nails for a rustic key hook around the mud room or kitchen! Also don’t forget to invest in a good level (electronic ones are great!) to make sure you are hanging up things straight. If you want a more advanced list, check out this one by Life Hacker! Their list is pretty extensive but each and every product truly has its benefits! Hi! I have exciting news to share that is truly a dream come true! I have just signed a deal for my very first line of branded products that will include bedding, sheets, pillows, stationary and a broad array of other soft goods. I am super excited! Stay tuned to see a Cathy Hobbs product in a store near you AND for plenty of these products to appear in our popular Design Recipes! With U.K.’s Highly Popular Urban Street Brand Plain Lazy in the U.S.A. Internationally Recognized Designer Will Work with Plain Lazy’s U.S. Marketing Firm- MVG to Launch Highly Popular British Skate/Surf Lifestyle Brand. New York – July 23, 2013. 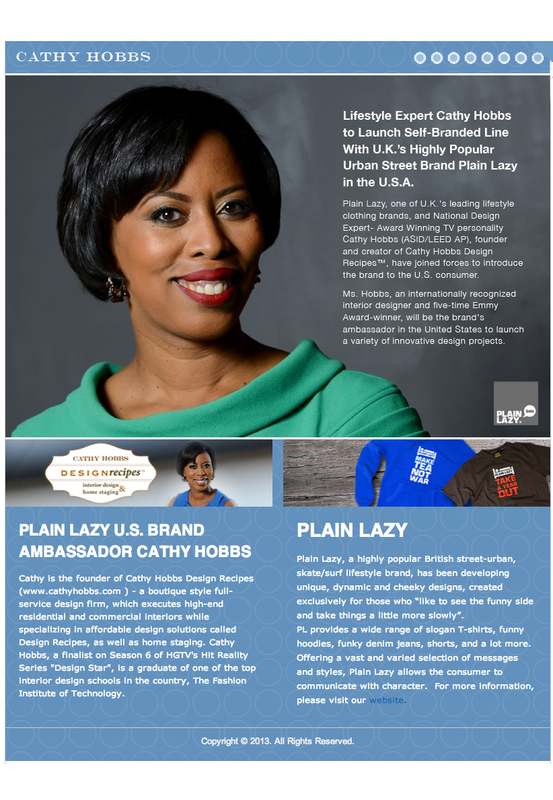 Plain Lazy, one of U.K.’s leading lifestyle clothing brands, and National Design Expert- Award Winning TV personality Cathy Hobbs (ASID/LEED AP), founder and creator of Cathy Hobbs Design Recipes™, have joined forces to introduce the brand to the U.S. consumer, announced Plain Lazy’s U.S. licensing firm Marlboro Victor Group (MVG). Ms. Hobbs, an internationally-recognized interior designer and five-time Emmy Award-winner, will serve as the brand’s ambassador and will launch a selection of innovative design projects in the United States, including an extensive line of products under the Cathy Hobbs Design Recipes brand. Ms. Hobbs will be working with MVG on a variety of online and offline promotions to raise the U.K. retailer’s brand in the U.S. market. A five-time Emmy award winning television personality, Ms. Hobbs is the exclusive brand ambassador for the world’s leading eco-friendly paint line, Mythic Paint and is currently the green expert for “The Life Improvement Squad” a national campaign with IKEA and O, The Oprah Magazine. She is also a veteran of Reality TV, starring in Season 6 of HGTV’s Hit Reality Series Design Star. A seasoned interior designer, home stager and television personality with more than 20 years of on-air experience as a local news anchor and correspondent, Ms. Hobbs is also the former Co-Host and Executive Producer of two real estate and design series “NY Residential” and “Metro Residential” which aired in (New York City) the number 1 television market as well as nationally. Hobbs was also the creator and co-owner of the “Metro Residential” series. Founded in 2003, Cathy Hobbs Design Recipes™ is a boutique style full-service design firm that in addition to executing high-end residential and commercial interiors specializes in affordable design solutions called Design Recipes™, as well as home staging. Cathy is a LEED AP recognized and credentialed by The U.S. Green Building Council for her exceptional expertise and knowledge of Green and Sustainable design and is the only Green Home Stager in New York City. She is also an NCIDQ certificate holder. A graduate of one of the top interior design programs in the country, The Fashion Institute of Technology, her commitment and vision is to make interior design approachable and affordable to all those who seek the services of a professional designer. Cathy also serves as a member of the prestigious interior design committee for The Fashion Institute of Technology. Cathy has been featured on programs like “The Nate Berkus Show”, “HGTV Design Star”, “HGTV’s Top Ten”, “Martha Stewart Living-Radio” and in publications like REDBOOK, O, The Oprah Magazine, and The Huffington Post. She is currently a regular contributor to the prominent shelter sites Sheknows.com, Shoptopia, Cotton Candy Magazine, and Ehow where Cathy also serves as an Ehow presenter hosting her own interior design web series. Plain Lazy, a highly popular British street-urban, skate/surf lifestyle brand, has been developing unique, dynamic and cheeky designs, created exclusively for those who “like to see the funny side and take things a little more slowly”. Founded in 1983, Plain Lazy is an offline and online clothing company which provides a wide range of slogan T-shirts, funny hoodies, funky denim jeans, shorts, backpacks, and more. Plain Lazy is based on promoting choice, encouraging freedom of expression and demonstrating individuality. Offering a vast and varied selection of messages, Plain Lazy allows the consumer to communicate with character. Happily spreading the ethos of the brand around the world, Plain Lazy is always looking for ways of making life lazier without compromising quality. Marlboro Victor Group (MVG) is a group of companies dedicated to online marketing, lead generation, licensing and sales. MVG’s activities include: Social Media Marketing – development of campaigns, apps and content aimed to make clients more competitive in social media; Licensing – identifying brands, executing market entry, managing brand development in the United States; Online sales – sales representation for content owners, targeting clients interested in online and interactive TV advertising; Cross-border consulting and client representation in selected industries; Product development for hand-picked projects in core competency industries. MVG acts as both an investor and operator in listed fields of activity. Back to School Dorm Ideas! Interior Designer Cathy Hobbs of Design Recipes Shares Ideas with “go to” resource guide Main Street.com! 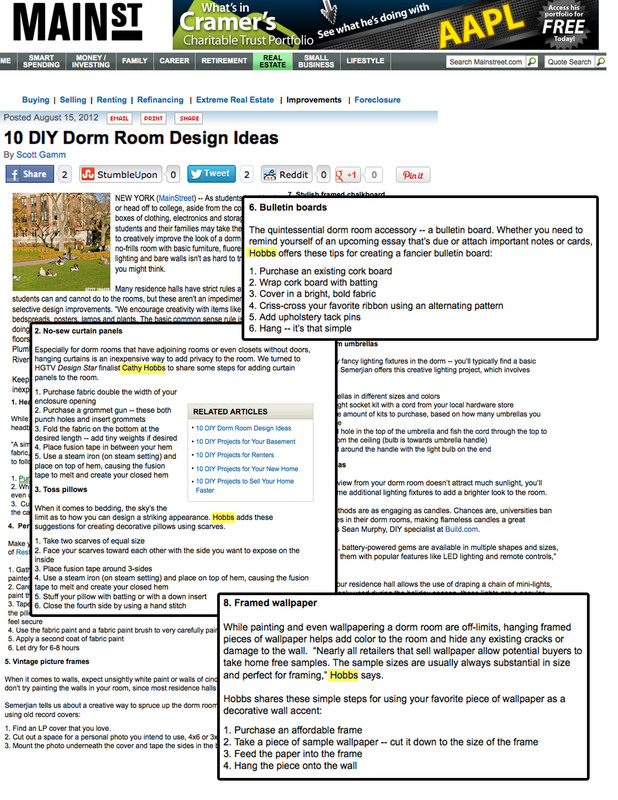 ≈ Comments Off on Back to School Dorm Ideas! Interior Designer Cathy Hobbs of Design Recipes Shares Ideas with “go to” resource guide Main Street.com! Looking for Nautical Theme Ideas? Cathy Hobbs of Design Recipes Shares Tips with Joonbug.com! ≈ Comments Off on Looking for Nautical Theme Ideas? 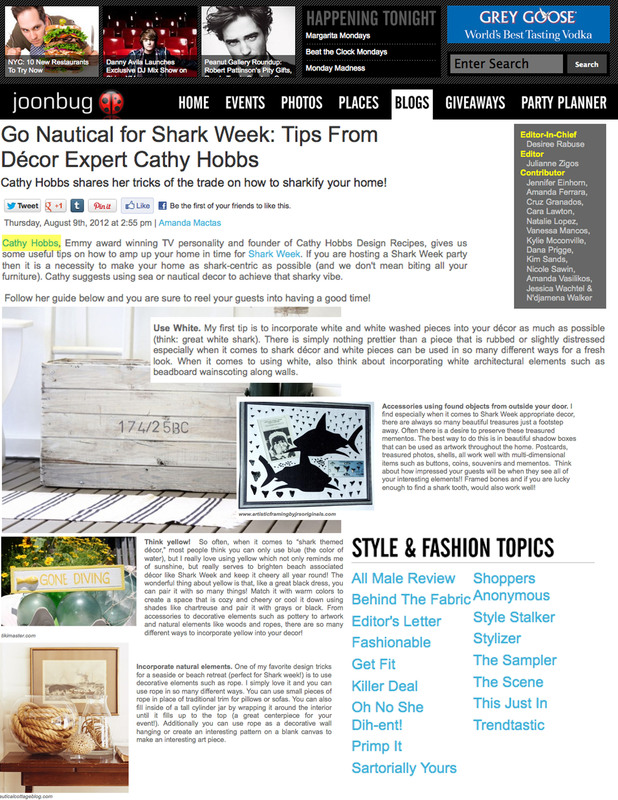 Cathy Hobbs of Design Recipes Shares Tips with Joonbug.com! 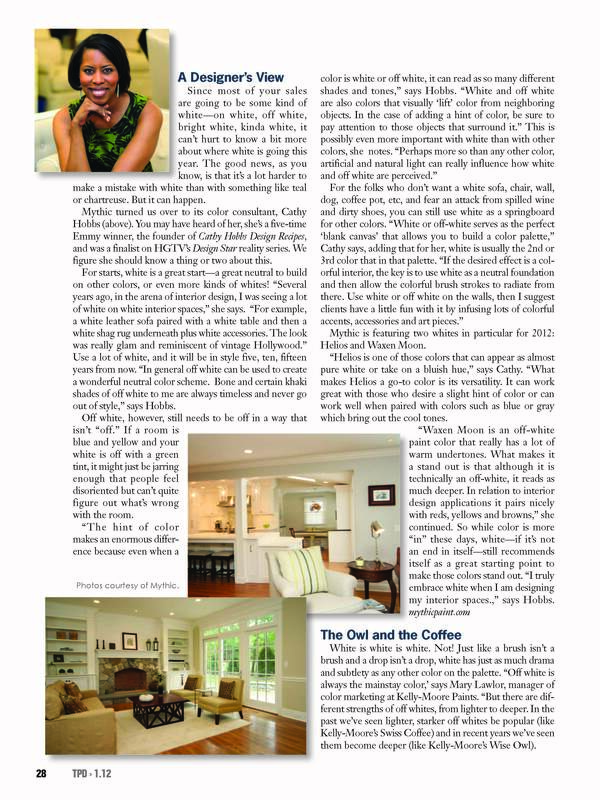 Celebrity Interior Designer Cathy Hobbs Shares Her Top Tips For Decorating With The Color WHITE! 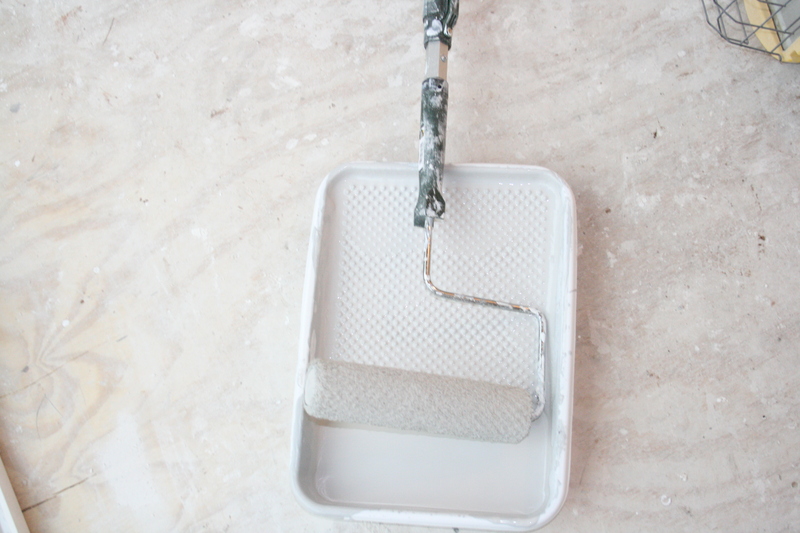 ≈ Comments Off on Celebrity Interior Designer Cathy Hobbs Shares Her Top Tips For Decorating With The Color WHITE! White is one of the most versatile and heavily used shades in home decor. But believe it or not it is also one of the most misunderstood. Yes, not all whites are created equal. There are a whole myriad of shades and tones. Some whites, have more gray, some more yellow etc. As an ASID Interior Designer and Certified Staging Professional, I can tell you that yes! you can mix different shades! Don't be afraid to go bold with Chartreuse! Looooooove Orange my signature color! Turquoise is a really hot color this season! Looks great with gray, chocolate and black! I have grown quite fond of this pepper green. It looks fabulous with pure white! When faced with the design dilemma of decorating my bedroom when I was a teenager, my mother called in an interior designer for help. The designer suggested painting one of my bedroom walls an “accent color” and before I knew it, a deep tangerine color had been painted on one of the walls. I loved it! Decades later, and after painting more accent walls than I can count, I find myself often being asked by my interior design and home-staging clients if they should add an accent wall into their design mix. My answer is, it depends. As an ASID interior designer, I use “accent colors” for a specific purpose: to incorporate a bold color into a space without “overdoing it” by painting every wall. 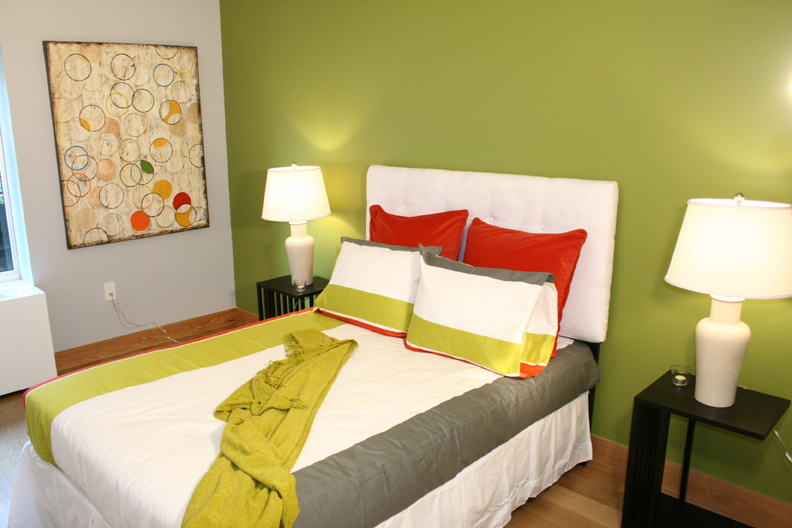 Accent colors not only add interest, but can also help to define a space architecturally. Accent colors can also highlight particular features of a space and serve as the foundation of a color palette. 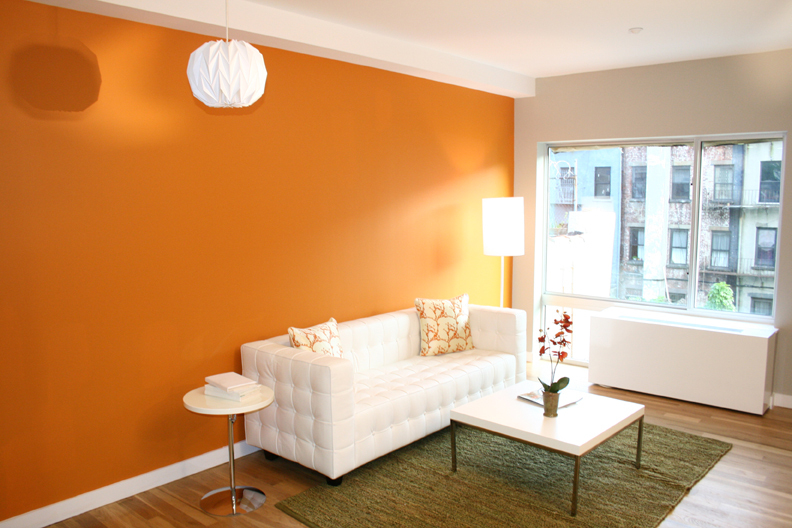 A tangerine color painted on one wall adds the right amount of personality to a room without overpowering the eye with color. (Courtesy of Cathy Hobbs Design Recipes) As part of the 3-day Certified Staging Professionals (CSP) certification course, of which I am one of their national instructors, we teach a color method for achieving the correct color balance in home staging involving the proper use of a primary, secondary, and accent colors. 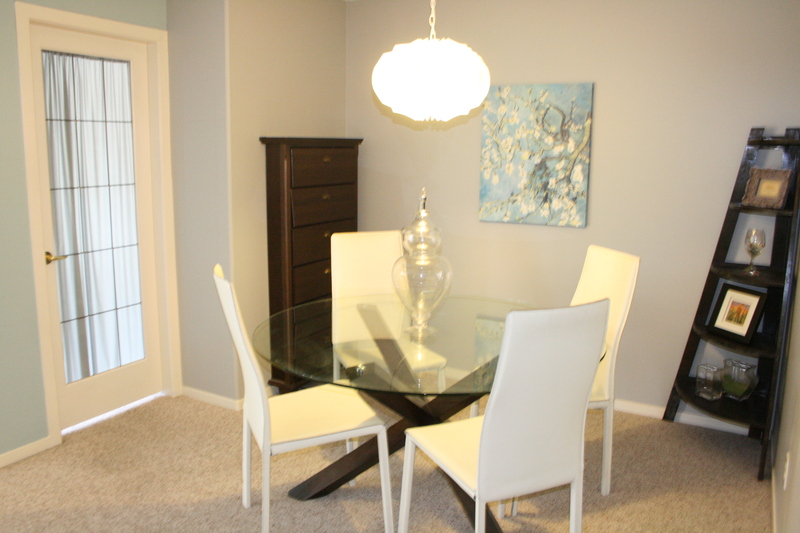 As home staging is about selling a property and having it appeal to the largest number of potential buyers as possible, it is essential when using color that the colors don’t come across as too “personalized.” Using an accent wall serves as a wonderful home-staging technique and painting solution because it is merely an accent. 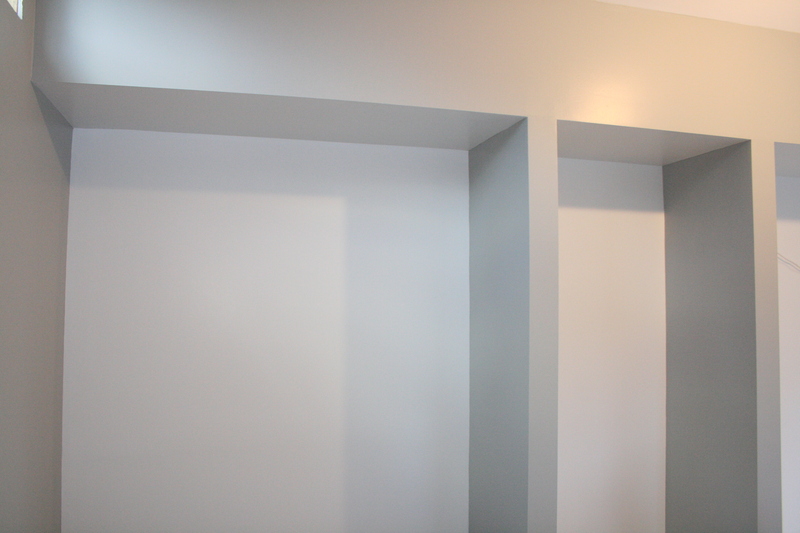 One wall painted a single color as opposed to a whole room painted a color that may offend. Stumped about which colors would make great accents? Think warm and inviting or bright and bold. 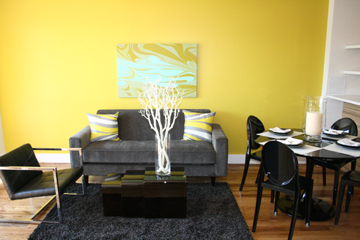 Yellows, oranges, and greens all make great accent colors and can easily blend with lots of color palettes. Stay away from muted or pastel tones, as they do not make great colors for an accent wall and are best suited for all over color. 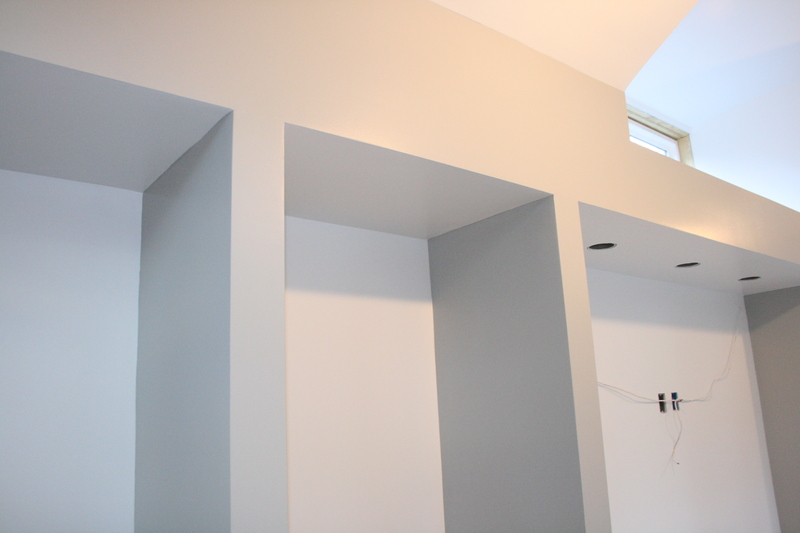 Accent walls should make a bold statement so that they stand out as opposed to blend in. When using an accent color in home staging, my suggestion is to have a little fun with it, and don’t be afraid to go bold!